I recently rediscovered this band. I can’t figure out why they ever left my regular rotation, too much other music to play I guess. 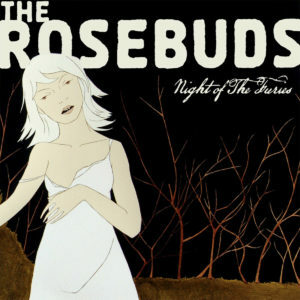 The Rosebuds are another North Carolina band, we’ve had a few of those on here lately. There must be something in the tobacco down there. Formed in 2001, they sound a bit like a poppy Radiohead. Anyway, it’s late and my girlfriend is sick, so not much writing tonight. I only have a couple of their seven or so albums and I intend to get more. If you happen upon one, definitely check them out and let me know what you think. Is that a zombie on the cover? Female vocals remind me of the Bangals, very talk-song-ie. I imagine it’s generally good music for riding the BART as your drive to your depressing life on the other side of the tunnel, but then again, who dies to DISCO!